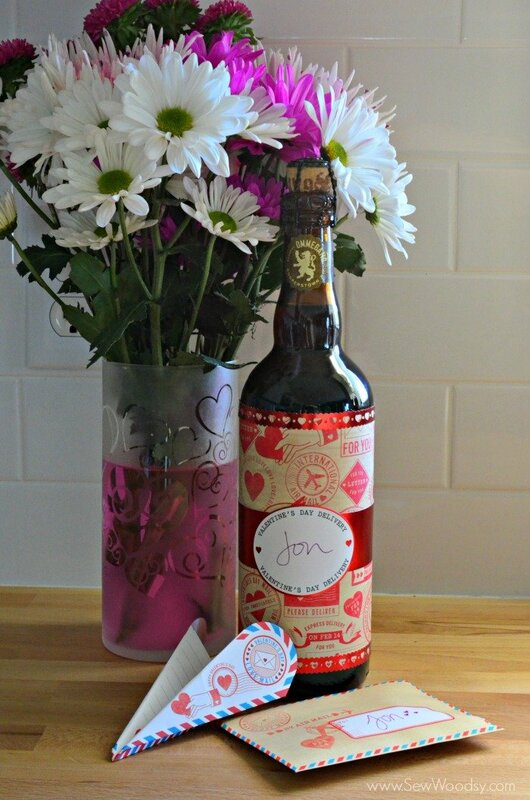 Last Minute Valentine’s Day Gift for Men + Decorate a Bottle in Minutes! This is a sponsored post on behalf of Martha Stewart Crafts. How is it, that Valentine’s day is today?!?! Where has the time gone with 2014 already? Normally, Jon and I share our homemade Valentine’s Day cards, but this year I decided to share with you an easy way to decorate a bottle in minutes. And a great “last minute” Valentine’s Day gift for the man in your life. We don’t ever exchange more than cards and I get flowers. Although I do try to get something for Jon that is valued around the same amount as the flowers. I wish it was acceptable (and that guys liked it) to get flowers, because I would give flowers right back. I love getting flowers. Jon rarely buys me flowers. I think I buy myself flowers more often then he does, so I always look forward to Valentine’s Day (and my birthday), because I know I’ll get flowers. How bad is that? The next best thing to flowers in a man’s book is beer. Or at least in my beer connoisseur’s book! If your hubby doesn’t drink beer maybe it’s an Italian soda or root beer? I decided to “wrap” the bottle by decorating it with some of the Valentine’s day products I received from Martha Stewart Crafts! 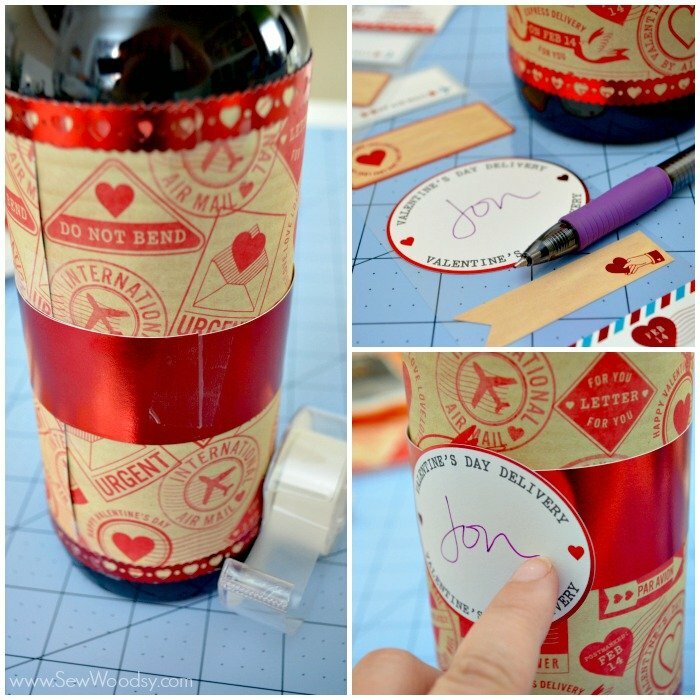 First, cut a piece of Valentine’s day themed paper to the size of the flat portion of your bottle. Using tape, adhere the paper to the bottle. 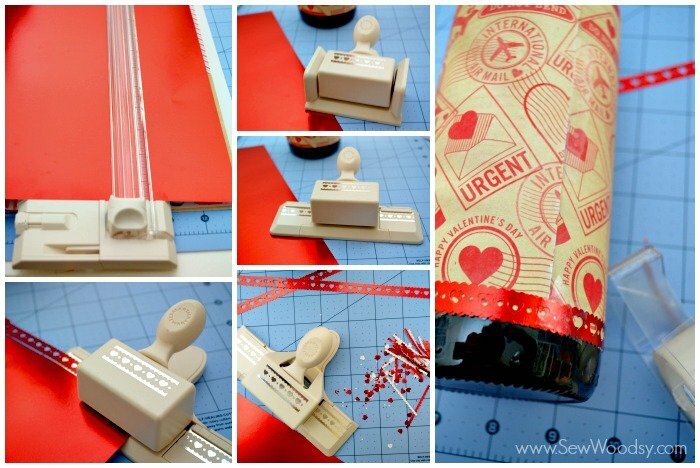 I chose a coordinating metallic red color for the heart border. What I love about the Martha Stewart Crafts punches is that the ends fold up (check out the top middle photos). I made two long heart boarders. Then, I added a thicker strip of red metallic paper to the center of the bottle. I wrote my hubby’s name on the sticker and stuck it on the red metallic paper! I finished off his gift with a semi-handmade card. 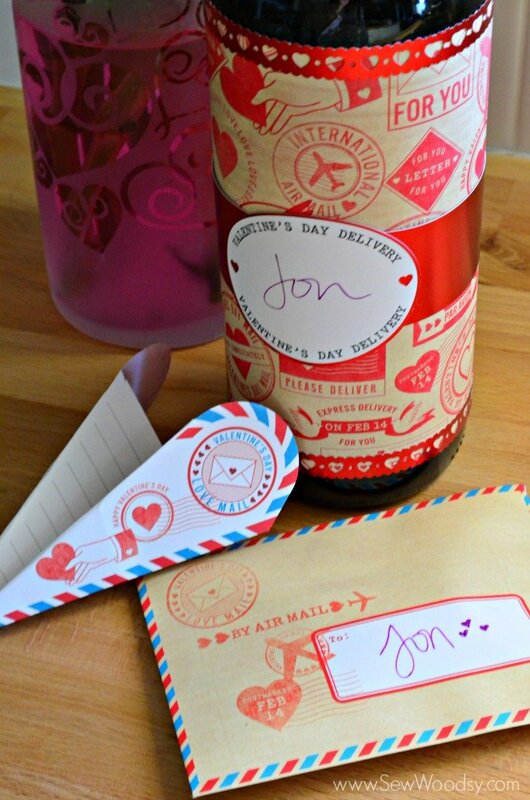 I loved the paper airplane Valentine’s day cards. I folded one up, wrote in it, and then took the heart cut-outs and sprinkled it inside the envelope (I love that detail, but I know its one that he will not appreciate since it will get everywhere). 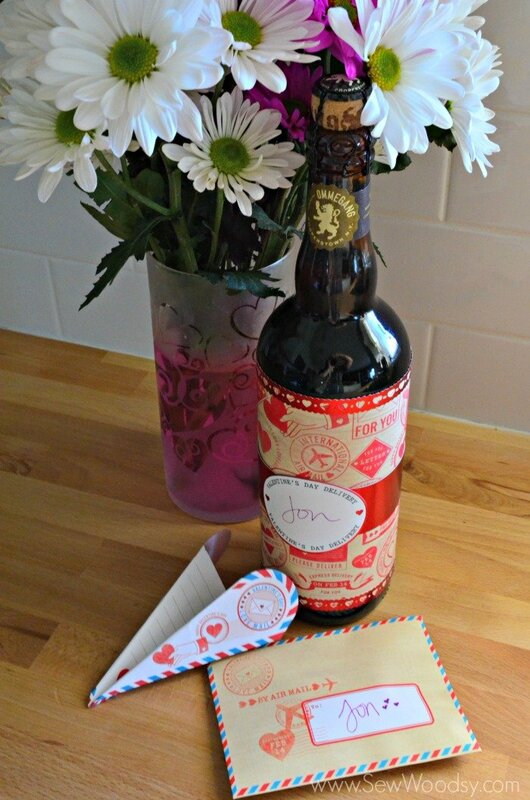 Like I said, in the matter of minutes I decorated his bottle of beer and had a card made for him. I think its a little more special then just handing him over a bottle of his favorite beer. 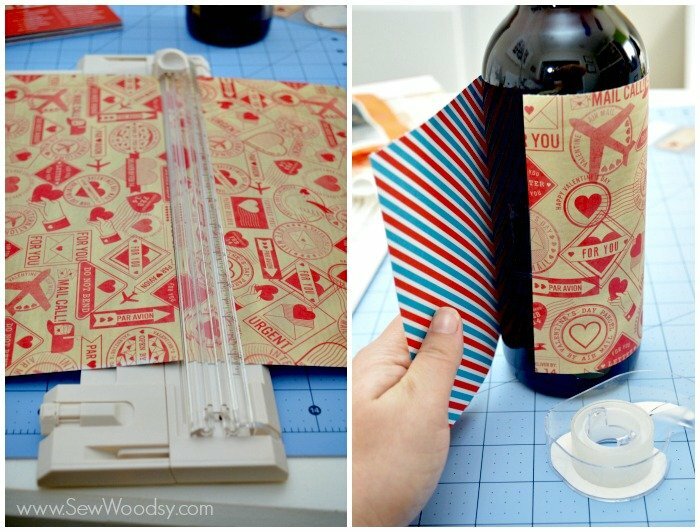 The next time you go to a party and bring a bottle of wine or beer, think about decorating the bottle instead of spending money on a pricey wine bag! The recipient will enjoy it that much more! Oh, and those are the flowers he got me. He likes to go with the untraditional variety (and I totally don’t care). If you look really closely the mums that are dyed pink have some heart shaped glitter on it! So what do you do for your sweetie for Valentine’s Day? We plan to go out to dinner tonight (something we rarely ever do on Valentine’s Day), only because it is our last kid-free Valentine’s Day where we won’t need a sitter! Disclaimer: This is a sponsored post on behalf of Martha Stewart Crafts. I received product and was asked to create a project using the product. As always all opinions are my own.